GUNNAR, the creator and world’s leading manufacturer of computer and gaming eyewear, today unleashed two new styles inspired by Blizzard Entertainment’s free-to-play online team brawler, Heroes of the Storm™. GUNNAR’s new Heroes of the Storm Strike and Siege models are forged with the same commitment to peerless quality, competitive design, and stylish fun that drive each of Blizzard’s unique creations. Wearers can personalize their frames at launch with up to 20 interchangeable Heroes of the Storm temple sleeves (sold separately), adorned with beautiful artwork featuring some of Blizzard’s most iconic characters. Created from feather-light, high-tensile steel for an easy fit with incredible durability, the Strike and Siege are built with the same one-piece front construction and fastener-free hinge design to deliver a smooth, sleek look and feel. Their gently curved, ultra-slim temples are structured to conform flexibly to a variety of head shapes without sacrificing stability, bolstered by adjustable silicone nose pads for extra grip. The Siege also features a wider fit than the Strike to comfortably accommodate larger game faces. GUNNAR’s proprietary and precision-engineered lenses reduce the harsh glare and eye fatigue associated with computing and gaming to keep players feeling energized and alert when the action demands it most. Both the Strike and the Siege offer a wide-format lens shape for crisp, panoramic viewing of high-resolution displays. Today’s announcement coincides with the official global release of Heroes of the Storm, which is now available to play for free on Windows and Mac. 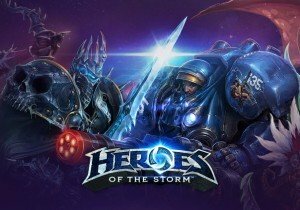 Heroes of the Storm brings together a diverse cast of iconic characters from Blizzard’s Warcraft®, StarCraft®, and Diablo® universes, and challenges them to compete in epic, adrenaline-charged battles. Players can choose from more than 35 Blizzard heroes and customize them to suit their play style, and then team up with friends to fight across seven dynamic Battlegrounds—with more heroes and Battlegrounds on the way. For more information or to download the game free, visit www.heroesofthestorm.com . The Heroes of the Storm Strike and Siege are now available in either Onyx Fire or Onyx Ice color schemes directly through GUNNAR’s website for $79.99 each. Individual swappable Heroes of the Storm temple sleeves can be purchased from GUNNAR online for $14.99 each. Keep an eye out for our upcoming product review! Fancy Fish Games is pleased to bring the exploration-based battler Deity Quest™ to PC, Mac, and Linux on Steam January 20th, 2015.